1 in 6 kids in America struggles with hunger. That's why I'm hosting a Friendsgiving for No Kid Hungry fundraiser this year. Everyone who donates will get a free copy my new Deliciously Healthy Thanksgiving Sides Recipe Guide delivered in your receipt email. Every $20 donated will help connect hungry kids to 200 meals, and $50 connects hungry kids to 500 meals! As we all gather with friends and family to celebrate the season, let's give back to those who may not be as fortunate as us. 100% of your donation will help ensure that our nation's kids are getting the food they need to thrive this holiday season—and all year long. 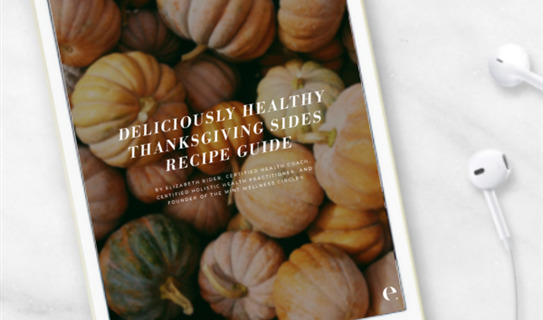 Get your Deliciously Healthy Thanksgiving Sides Recipe Guide when you donate to this campaign! Elizabeth, thank you for caring for the poor. God will bless you! Thank you for all you do to push us to be better people. Thank you for reminding me to share my good fortune. Giving thanks to Elizabeth for reminding us to be generous! Fabulous idea. So glad to partner with you on this endeavor! Thanks Elizabeth for your commitment to making no kid hungry. LOVE that you're doing this!!! Thanks for doing this and sharing your recipes. Amazing idea and partnership Elizabeth! Thank you for this, Elizabeth. This time of year is especially difficult for some families, and I'm happy to support your cause. Love to support the kids!! So sad this really happens in the USA. It shouldn’t be so! Thanks Elizabeth for taking the time to offer this opportunity to us to be a blessing and for sending us a blessing in return! Thank you Elizabeth Rider for sharing this information. We're happy to contribute to your No Kid Hungry Campaign. Lots of love to all of our children during this holiday season and throughout the year. “Children are a heritage from the LORD, the fruit of the womb is a reward.” May God bless these children and their families. Elizabeth, Thank you for always supporting and helping others. I appreciate all you do for others. Thanks for all you do, Elizabeth to promote this wonderful cause and healthy eating! You are amazing! Thank you so much, Elizabeth, for ALL you do to promote healthy eating + for supporting this wonderful cause. Many blessings to you! Thank you Elizabeth for sharing this wonderful cause with me! I am happy to support!! In gratitude for all I have received in my life to those that need it most. Let's keep ALL of our children fed so they can thrive!! Thank you Liz for doing this! What a great idea! Seems like a good cause, and a good recipe you are giving. Good idea, and good job! Blessed to have the opportunity to help make a difference! Still supporting you and all you do!